A lot of high fashion is about the clothing. You feel like you are promoting a brand when you wear it, instead of yourself. Sid Mashburn clothing amplifies the person, not the fashion. Sid’s a confident guy. We felt that a brand so secure in its identity and capital should take a risk to differentiate themselves from other fashion advertising. Since the focus of the campaign is on the customer, why not just show guys being comfortable, and make the briefest of nods to the product? Lesser brands wouldn’t be able to pull it off, but Sid Mashburn can. The print isn’t completely divorced from the product; via AR the line drawing is replaced by actual Sid Mashburn clothing. An extension of the print campaign. 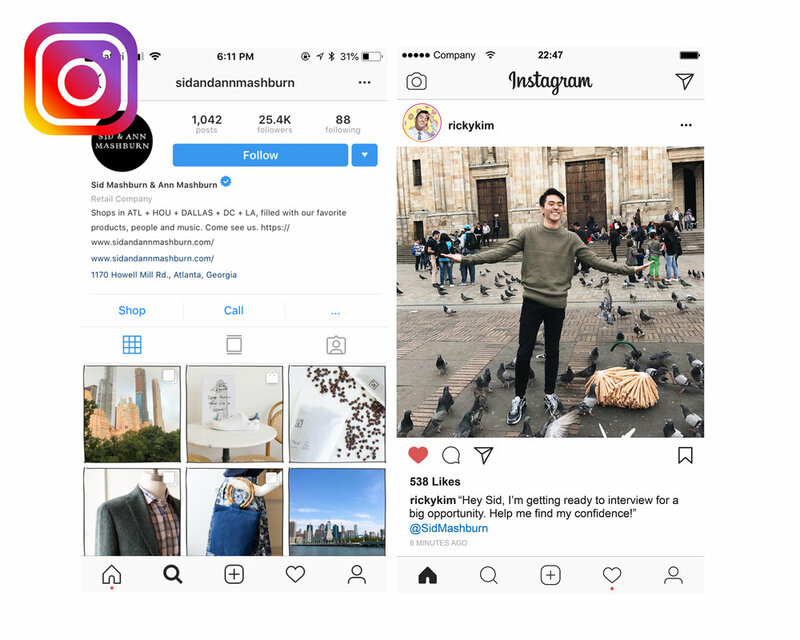 Instagram users send in a photograph of themselves, and an artist for Sid Mashburn “outfits” them in Sid clothing in the same style as the print ads. In each posting is a link to purchase the drawn items at Sid Mashburn’s online store. Sid likes moodboards. This is a living moodboard to be placed in a heavy foot-traffic area (outdoor malls, airport terminals, etc.). In addition to thematic and decorative touches, it contains smaller ready-to-wear items available for purchase at a nearby kiosk.